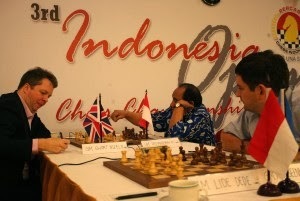 One of the strongest chess opens of the year, Indonesia Chess Open 2013, has started. There was going to be very few easy matches even in the first round given the strength in depth of the Indonesia Open Chess Championship (IOCC) 2013 with as many as 91 titled players (including 38 GMs) in a field of just 108 players (participants list). Most of the top seeds, Alexander Moiseenko, Nigek Short, Aleksey Dreev, Eduardo Iturrizaga, Surya Shekhar Ganguly, Ivan Solokov and Ivan Ivanisevic all won comfortably to be amongst the early leaders. A favorite in highly rated GM Nguyen Ngoc Truong Son was however held to a comfortable draw by Indonesia’s best young prospect for its next IM in Lufti Ali Muhammad and their latest WGM Medina Warda Aulia also did not disappoint either with a fighting draw against GM Ehsan Ghaem Maghami. Young Anton Smirnov successfully claimed a repetition against GM G.N Gopal, GM Sandro Mareco could not make headway against the experienced WGM Maria Manakova while GMs Salem A R Salleh, Oliver Barbosa and Eugene Torre had to also settle for half a point against IM Emmanuel Senador, FM Le Tuan Minh and local Firdaus Maksum respectively. The big upset was the win over GM Tsegmed Bathuluun by Kazakhstan’s big hope in the young talented WGM Guliskhan Nakhbayeva. FM Anjas Novitas is still one of Indonesia’s best players and he proved it with a comprehensive win against GM Mark Paragua with two less known countrymen, Satarno and Adhy Margana upsetting IMs Djurabek Khamrakulov and Sophie Milliet, even if the latter messed up a winning position in a desperate time scramble. After the intense battles of the first two days of Indonesia Open 2013, round three was seemingly a relatively peaceful affair, but even if there were draws amongst the leaders on the top four boards, all were not with fights. GMs Alexander Moiseenko, Vaibhav Suri, Nigel Short, Vadim Malakhatko, John Paul Gomez, Aleksey Dreev, Gundavaa Bayarsaikhan, and Surya Sekhar Ganguly were therefore joined by GMs Antoaneta Stefanova and Igarza Renier Vazquez who had the only really quick draw and Hoang Thanh Trang who held off Jaan Ehlvest on 2.5/3.